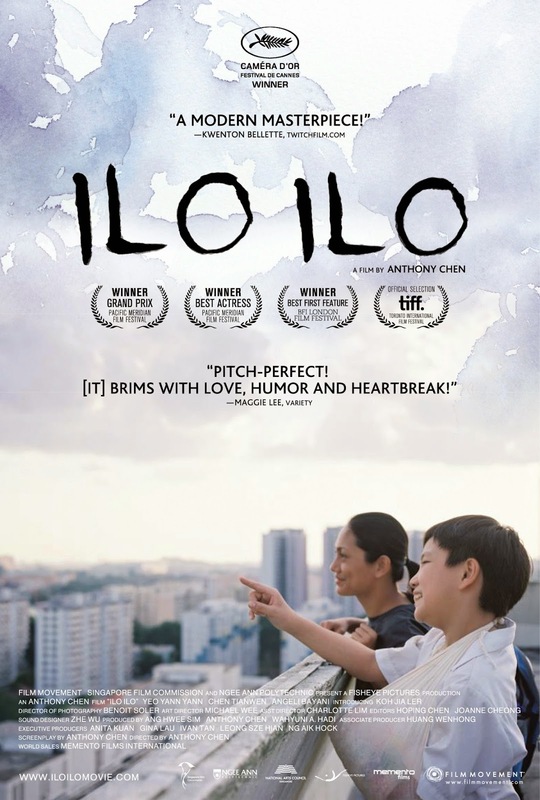 Ilo Ilo is the feature debut film for Singaporean writer/director Anthony Chen. And it's a pleasant surprise. It shows an uncommon craftsmanship for a debut film. It offers a somewhat autobiographical account of life with a Filipino house maid, and the struggles parents went through during the Asian financial crisis of the late 90's. Jiale (Jialer Koh) is a bratty, mischievous child constantly getting into trouble. His pregnant mother Hwee Leng (Yann Yann Yeo) is growing tired of having to leave work to go to his school to deal with angry teachers. She's also far enough along in her pregnancy that she could use help around the house. They hire Terry (Angeli Bayani) as their live in housemaid. Having a Filipino housemaid is very common in southeast Asia, particularly in more affluent cities such as Hong Kong and Singapore. At first Jiale bristles at the idea of having Terry around, and refuses to interact with her. He even goes out of his way to make life miserable for her. However, after an accident leaves Jiale with a broken arm he's forced to rely on her to do most everything for him, including bathing him. Over time they start to bond, and while Terry takes care of him and looks out for him, she also knows how to have fun with him while still being strict when necessary. In many ways she becomes a better mother to him than his own mother. His real mother, of course, isn't fond of the idea of surrendering her motherly role. She becomes jealous that Jiale is forming the kind of bond with Terry that she wishes she had with him. It could have been all too easy to paint the mother as the villain here. She is clearly the controlling center of the family. She's angry at losing face because the father began smoking after losing his job, and she expects so much out of Jiale that she has a hard time forming a bond with him. And yet, Chen allows us to sympathize with her. We understand her struggles and never think of her as a villain. Chen understands that, that's how families work. Despite our flaws, families don't think of each other as villains. In fact, there is a touching scene later in the film where the mother and father sit together and finally admit their flaws (things they'd tried to keep secret from each other up to that point) and they accept each other despite them. It's maybe the first sign that the family will work together to get through this time of financial uncertainty. It's a complex family dynamic and Chen weaves through it with ease. The way Chen takes us through every day activities and forms a picture of these people's lives, while making us care about each character, despite their bad qualities, is nothing short of outstanding film making. Chen will most certainly be a director to keep an eye on in the future.